Stanford has new geospatial networking tool, Orbis, that lets you calculate travel times, distances and costs in theRoman Empire based on data for the early 3rd century A.D. Think of it like Google Maps and Travelocity rolled into one.Prices and routes vary according to time of year and mode of travel, all of which can be selected in the Orbis dashboard. Since one almost surely would have passed through Alexandriato get to the pyramids at Giza, and the walls were in Babylon with the Hanging Gardens, using Antipater's list wouldn't make much of a change to the route. Not all of these places are available in Orbis, so I selected the closest point possible. 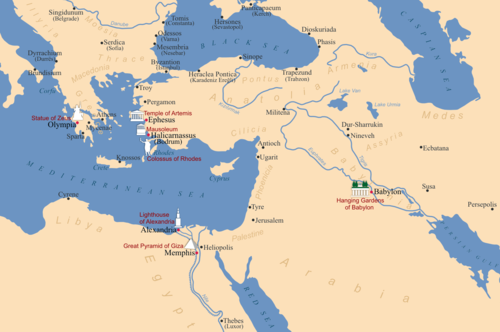 In particular, for Olympia I chose the mouth of the Alpheus River, for Giza I chose Memphis, and Dura for Babylon. I also chose what seemed like the most logical route to me: starting with Olympia, jumping over to Asia Minor for Ephesus and Halicarnassus, then down to Rhodes, before crossing the Mediterranean to Egypt and finally heading east toward Babylon. When planning these routes I chose to use the price list for travel by donkey. Under speed options I selected the slower means of sea travel for the cheapest route, but for the shortest and fastest routes I went wild and selected the private transport speed option! Distance and time are pretty self-explanatory. But how much is a denarius worth in modern terms? Conversions from ancient to modern currencies are fraught with difficulties and most scholars will warn you away from such attempts. It is possible, however, to get a sense of how much one of these travel options would have cost by comparing known prices for common goods and salaries. The denarius was the Romans' most common silver coin. When the denarius was first introduced in the 3rd century B.C.E. it was the equivalent of 10 asses, small denomination copper coins, but in the 2nd century B.C.E. the denarius was valued at 16 asses, which remained the standard throughout much of the Imperial Period. At the beginning of the 3rd century A.D., contemporary with the data used by Orbis, a Roman legionary earned about 400 denarii per year. Living in Romean individual would have spent about 60-90 denarii per year on grain/bread which was the staple of the Roman diet (see an example of wages and prices here). So a trip to see the wonders of the world would have been quite an expense for most people inRome. Looking at the results, if you only wanted to be able to say you saw all seven of the wonders, the fastest route seems to be the best choice. Not only is it faster, but probably much more cost efficient in the end. It is more than double the price of the cheapest route, but by cutting out an extra month and a half of travel time one could save on other travel expenses. Nowadays those expenses would be food and lodging, but in antiquity travelers frequently stayed as guests in private homes. Networks of friends, family, friends of friends/family provided room and board, but these often times included exchanges of gifts. There would undoubtedly still be times, on a trip such as this, when travelers would be compelled to rent accommodations and buy food, not to mention souvenirs. Orbis is a great tool and lots of fun to play around with. It will be interesting to see how it develops and how people make use of it. I can also say from my own experience that they are extremely prompt and helpful when responding to questions.